the wailing: “I paint; I don’t know how to balance a checkbook.” Translation: I paint, therefore I shouldn’t even have to balance a check book. “I belong in the studio, not hawking my art!” Translation: I was born to do this, so how dare the world expect me to soil my hands with selling. “I’m right brained, after all!” Translation: I’m an artist who is naturally handicapped, in a good way, so please someone else step up here and help me. Now, I sympathize with the wailing. (I even do it myself now and again!). I would also expect this wailing to be recognized for what it is: a very temporary fall back, when life gets hard, to a younger self that has not yet developed into your sophisticated and mature adult-now self. For, as artists, as professionals, we are anything but singular. Artists: Where Do We Fit? Artists seem more akin to sociological categories, like parents, where multiple skill sets are called into play, than as careerists. Or entrepreneurs, where big visions drive small details. Parenthood is not a career. An entrepreneur isn’t even a career. In both cases, it’s a calling – almost more religious in scope than any other social role we humans have come up with. Then again, in the commercial world (and, hey, we’re all on one side or the other of the commercial world), an artist, who is working at making a living from art, is actually a small business. And here again we have the tyranny of language because the lay person’s understanding of business is at the opposite end of the spectrum from an understanding of artist: one is commerce, the other creativity. However, even though these two worlds are often happily intertwined, there is the gut feeling (language trap!) that commerce and creativity are oil and water. How on earth is an artist to get on with the business of art when “commerce” is the guy in the black hat and “creativity” is the woman floating around in white? Then, There’s All Those Damn Hats! Here’s where the feeling that an artist is one thing really gets in the way. If we are one thing, then why on earth are we…. Good grief…. I’m not even half-way through and my closet is already jammed with hats! What if all the resentment around not being able to stay focused only on what you consider the upside of your artist life (making art), is simply a misunderstanding about what and who an artist really is? What if you changed the definition of yourself… as an artist? What if you found yourself enjoying the hat with the hot pink feather, or the stovepipe look of Dickensonian days? 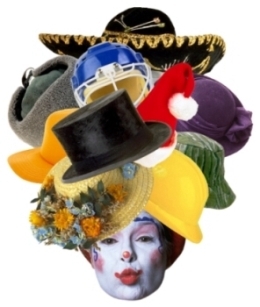 What if all those hats were the upside of being an artist? What might change for your? You know, of course, that generating revenue as an artist is also a many splendid thing, a goose laying basketfuls of golden eggs, the endless arms of Shiva, yes? If you’d like all that hat wearing to lead to ka ching! Check out her presentation here!